In 2008, the first near-total face transplant was performed in the US. After that, an increasing number of face transplant procedures have been undertaken in the US as well as other parts of the world. This cosmetic surgery procedure offers a revolutionary solution to people with severely deformed faces allowing them to have a partially or totally restored face from a donor. Dedicated board certified facial plastic and reconstructive surgeon Dr. Eric Yavrouian provides facial transplants to patients in Glendale, Pasadena, Burbank, Greater Los Angeles, Beverly Hills, CA, and surrounding locations. A face transplant is a procedure that replaces a portion or the entirety of an individual’s face. Face transplant candidates are people with severe facial disfigurement due to cancer, trauma, or a birth defect. These candidates will undergo psychological testing to determine their emotional fitness to receive a face transplant. The time taken for the entire process is up to three years. The initial step in a face transplant cosmetic surgery procedure is to obtain a healthy, matching donor tissue. After that, the candidate is prepared for the face transplant surgery. In this procedure, the surgeon must connect the new tissue and restore the flow of blood to the “new” face. In general, the patient receives other surgeries pre and post the face transplant. The patient will also undergo a complex and extensive rehab process following the face transplant. This will involve the patient learning how to speak, eat, and create facial expressions. A face transplant is distinct from a free facial flap procedure as it involves tissue from a donor. On the other hand, in the free flap surgery, skin and tissue are sourced from another location on the patient’s body. This distinction is crucial as it means that the patient will not experience the risk of rejection or require immunosuppressant medication in a flap procedure. An individual receiving a face transplant will be on immunosuppressant medications for the long term. These medications assist the body in accepting the new face. However, there is a tradeoff as these immunosuppressant medications could increase the risk of infections. But face transplant patients are usually in good health. This changes the risk-reward profile of immunosuppressant medications. Permanent loss of sensation and movement in the transplant and necrosis (tissue death) are other possible complications associated with face transplants. Recent research indicates that some individuals do redevelop the ability to chew, smile, and speak within a year of their face transplant surgery. How does an Individual look like after a Face Transplant? A face transplant patient will not appear identical to the donor. Rather, the outcome will be more of a hybrid appearance. This does not mean that the patient may not face any psychological issues associated with identity. The face is an integral part of an individual’s sense of self. According to the American Academy of Facial Plastic and Reconstructive Surgery (AAFPRS), face transplants should only be performed on a person when all other options have been unsuccessful. 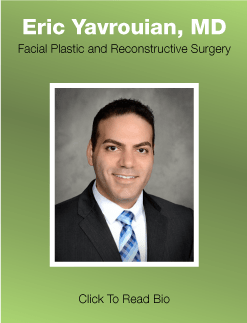 Reliable facial plastic and reconstructive surgeon Dr. Eric Yavrouian receives patients from Glendale, Pasadena, Burbank, Greater Los Angeles, Beverly Hills, CA, and other towns and suburbs in this region of the southwest for facial transplants.